hangar accessories, windows, and bi-fold doors. The rigid frame straight wall metal building kit is among the most widely used building for aircraft hangars. The building is certified for hurricane force winds and heavy snow loads and is virtually maintenance free. The steel structure is sealed tight and mostly impervious to rodents and pests that could get into your engines. With insulated roof and wall cladding along with the proper ventilation your aircraft hangar will have the perfect environment for storing your airplanes or other aircraft. Hurricane Steel Buildings® uses the best commercial grade galvalume wall and roof cladding from 20 - 26 gauge along with the solid rigid frame backbone it’s the most structurally sound steel hangar building you need. Every metal aircraft building is coated with Energy Star® approved paint designed especially for metal in harsh weather conditions and has a 40 year warranty. Our pre-engineered metal buildings designed for aircraft hangars are wind and load certified for regions across the world from hurricane force winds to heavy snow conditions. Our steel arch aircraft hangars buildings can be built to hundreds of feet long and plenty of width and height clearance for any aircraft. Our insulated bi-fold doors with electric operation are recommended for aircraft hangar because of the 100% clearance from the ground to the top of the entrance opening. The quick automated operation is smooth and efficient and an alternative to roll up or sectional doors. We provide turnkey solutions for the construction of your hangar and can assist you in hiring the best crews with expertise in metal building planning, foundations, and construction. We are experienced in building airplane hangars as well as designing floor plans, help with permitting and local building codes. Store your crop duster, glider, helicopter, biplane, single engine plane or military aircraft in our solid steel hangar buildings and be rest assured you have a solid building protecting your fleet of planes. We assist clients in all 50 states with designing and constructing the ideal hangar for our clients at a low cost snd much more economical than a wood frame or brick and mortar building. There are no beams or posts or trusses in your aviation hangar so the interior is 100% usable. Construction is easy using our building manual and customer service along with a small crew and light equipment such as pulleys or a small crane. 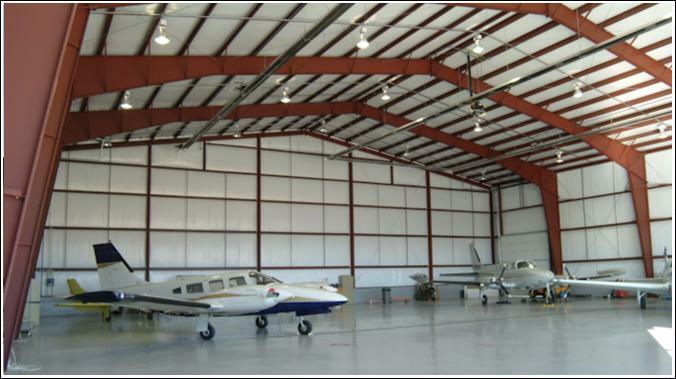 Design your airplane hangar steel building with custom doors, windows, skylights and ventilation. When pouring your foundation consider adding a drainage system for maintenance and cleaning. Add electrical, plumbing and maintenance areas for your mechanics to service your aircrafts. The specially formulated paint on our hangars, formulated by a top manufacture of synthetic resins, and paint finishes helps prevent rust and comes with an industry best 40 year rust-through perforation warranty and against peeling paint, flaking and loss of adhesion. So with the lower cost, solid construction and design and the capability to customize your steel hangar and even expand it later by extending the length the metal building kit is the best type of building for an aviation hangar. Talk to our aviation hangar building consultants to help plan your hangar and answer any questions about our buildings.